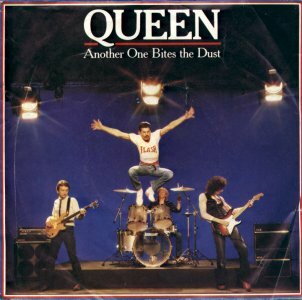 "Another One�Bites the Dust" is of course the classic Queen song from the '70s. This has only been done live, and never in a full cover, just in little bits of a funk cover medley. Sometimes, it was just the bassline (which is as distinct as anything else from the song), and I don't believe much more than just the title chorus was sung. A few of the times, Beck let Brian Lebarton sing some of the song during their funk jam medleys. Here is the Wikipedia about Queen.